Aloe sanguinalis, or Somali Red Aloe, forms large, conspicuous clumps and has blood red sap. Its can easily be spotted from the road, but the species has only just been named and described in the open access journal PhytoKeys. It remains a mystery how this beautiful and showy aloe species has remained undescribed by science for so long, but one of the theory is that the plant was ‘hiding in plain sight’ in an area not usually known for its high biological diversity. The locals in the area have long known that the plants were different from other kinds of “Dacar”, (the Somali name for Aloes) in the region and were referring to them as “Dacar cas” or “Red aloe”. 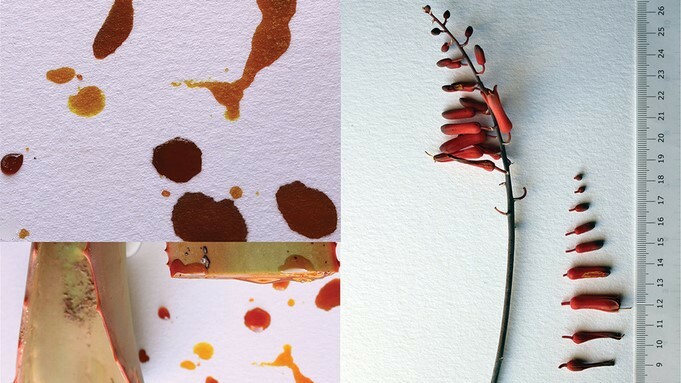 Similarly, the scientific name for the new species – Aloe sanguinalis – is based on one of its most distinct characters, its bright red color, coming from the peculiar blood-red sap the plant produces. The leaves also become reddish as they mature. 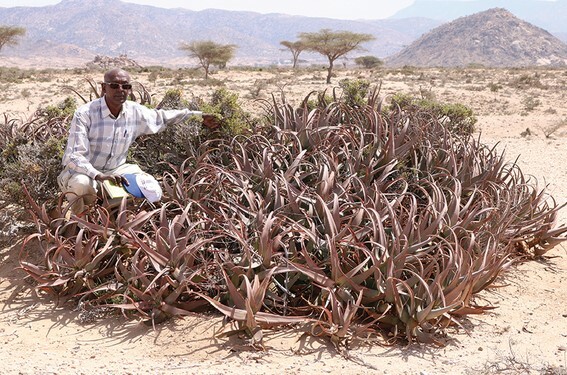 The story of the formal recognition of “Dacar cas” or Aloe sanguinalis, however, began when Ahmed Awale, a leading Somaliland environmentalist, spotted the large, reddish clumps plants, while driving through the country on behalf of Candlelight, an NGO focused on the environment, education, and health. Later on, when the plant came to the attention of Mary Barkworth, a botanist interested in building botanical capacity in Somaliland. After listening to Ahmed, the two of them began looking formally into the possibility that “Dacar cas” was, indeed, an undescribed species. They were soon convinced it was. After the initial excitement, the next step required demonstrating that “Dacar Cas” differs from all the other 600+ known species of Aloe. That step took longer, but finally it has been done. Aloe sanguinalis, or Dakar Cas, together with Ahmed Awale. “This news comes from a region which had experienced periods of conflict and instability, climate change effects and accelerated environmental degradation, whereby much of the people’s attention has been focused on promoting livelihoods and resilience. With this positive piece of information we hope that we inspire scientists to further explore the area,” explains Dr Barkworth. The new species is currently known from only two locations, but it is hoped that naming and sharing pictures of it online will encourage discovery and documentation of additional locations. Images and locality information for new locations are welcome at faisaljama24@gmail.com or mary.barkworth@usu.edu.